In Outlook 2016 for Windows, and Outlook for Mac 2016 or 2019, email messages, contacts, calendar items, tasks, and notes can be exported to archive files. You can import these files (.pst in Outlook for Windows and .olm in Outlook for Mac) into Outlook for Mac. Once imported, the archived email messages, contacts, calendar items, and so on are available in the On My Computer section of the Outlook navigation panes (Mail, Calendar, People, Tasks, and Notes). NOTE: If On My Computer is not listed in the navigation panes, access the menu Outlook > Preferences…, select General, and clear the setting for Hide On My Computer folders. In addition to importing archive files, Outlook 2016 for Mac, Outlook 109 for Mac, it also supports importing identities from Outlook for Mac 2011. Importing identities is used primarily when upgrading from Outlook 2011 to Outlook 2016 for Mac. Note: You cannot import Outlook on the web calendar and contacts, iCloud calendar and contacts, or Google calendar and contacts at this time. To request these features, visit the Outlook Suggestion Box to leave your feedback. The Outlook team is actively monitoring this forum. A .pst file is the data file used by Outlook for Windows to archive your email messages, contacts, calendar items, tasks, and notes. You can import the .pst file in order to transfer messages from a Windows-based computer to Outlook 2016 for Mac or Outlook 2019 for Mac. Transfer the .pst file from your Windows computer to your Mac (see the Apple web site for instructions). On the Tools tab, choose Import. Select Outlook for Windows archive file (.pst) > Continue. Locate the .pst file on your Mac, and then choose Import. When the import process is complete, choose Finish. The imported items appear in the navigation pane under On My Computer. A .olm file is the data file used by Outlook for Mac to archive your email messages, contacts, calendar items, tasks, and notes. 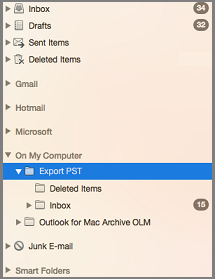 If you're moving from one Mac to another or upgrading from Outlook for Mac 2011 to Outlook 2016 for Mac or Outlook 2019 for Mac, you'll want to export your email messages, contacts, calendar items, tasks, and notes to a .olm file first (How do I export to a .olm file?). Note the location where you save the .olm file because you'll need it during the import process. Export your Outlook for Mac email messages, contacts, calendar items, tasks, and notes to a .olm file and note the location where you save that file. If moving from one Mac to another, transfer the .olm file to the new one (see the Apple web site for instructions). 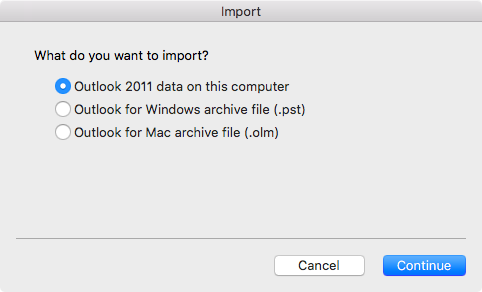 In Outlook 2016 for Mac or Outlook 2019 for Mac, on the Tools tab, choose Import. In the Import box, select Outlook for Mac archive file (.olm) > Continue. Locate the .olm file on your Mac, and then choose Import. Imported items appear on the navigation panes (Mail, Calendar, People, Tasks, Notes) under On My Computer. For example, contacts are in the navigation pane on the People tab, email messages are on the navigation pane on the Mail tab, calendar items are in the navigation pane on the Calendar tab, and so on. A profile, also known as an identity in Outlook for Mac 2011, is the set of data contained in Outlook, including accounts, email messages, contacts, calendar items, tasks, notes, categories, rules, and signatures. Outlook 2016 for Mac and Outlook 2019 for Mac supports importing Outlook for Mac 2011 identities, a process typically used when upgrading from Outlook 2011 to Outlook 2016 for Mac or Outlook 2019 for Mac. Important: An Outlook for Mac 2011 identity can only be imported into an empty Outlook 2016 for Mac profile. An empty profile is one where accounts or other data have yet to be added. We suggest you create a new empty profile in Outlook 2016 for Mac using the Outlook Profile Manager (see I get an error when importing Outlook for Mac 2011 data) and then proceed with the steps below. In the Import box, select Outlook 2011 data on this computer > Continue. Choose the location of the identity for import. Import from another location allows you to browse your Mac for the identity. Imported items, including accounts, email messages, contacts, calendar items, tasks, notes, categories, rules, and signatures, appear in the same location as they did in Outlook for Mac 2011. Important: When attempting to import an Outlook for Mac 2011 identity to Outlook 2016 for Mac you receive the error message,"Your identity cannot be imported as you do not have sufficient permissions on your 2011 identity," see the KB article, Outlook for Mac for Office 365 – Permission error while Importing an Outlook 2011 Identity. Can I import contacts from a .csv file into Outlook 2016 for Mac? Importing of Excel or CSV file into Outlook 2016 for Mac isn't supported. For suggested workarounds, visit Answers.Microsoft.com. 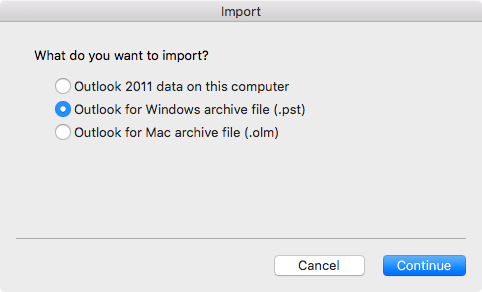 Can I import from Entourage 2008 into Outlook 2016 for Mac? It's a two-step process. 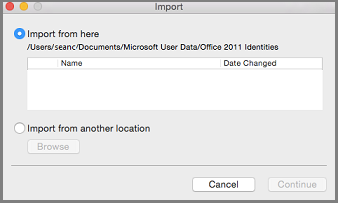 First, import your Entourage data into Outlook 2011 for Mac. 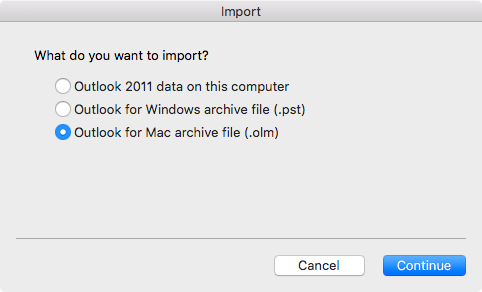 Once that's done, import from Outlook 2011 to Outlook 2016 for Mac by following the steps in this article. Visit Answers.Microsoft.com for more information. Can I import iCal or Address Book items into Outlook 2016 for Mac?